The title and cover suggest that this book is a nonfiction tale of foul play, science, and medicine. That is partly true, but Holly Tucker’s style lends itself to a novel set in the 17th century, engaging the reader in the times and personality of the players as if he or she is a part of a play. Blood Work is an elegant mix of art and science, an amalgam of jaw-dropping horror and inspiration, even including a Dramatis Personae, much like William Shakespeare did in his plays. Interestingly, this character list pits the French players against the English ones. There is a reason for this: The cast of characters are at times contentious with one another, perhaps even driven to murder, but the really important part of this book is the take-away message for today’s scientific, medical, and political environment, which is that how we approach scientific research today will determine much of what occurs in the field in the future. Blood Work is the true story about how we got to our old notions of what blood was, how circulation worked, early transfusion science, and what happens when long-held beliefs are challenged. It entails extensive research of the past, yet resonates with the challenges that science research now faces today, for it illustrates how much our knowledge and curiosity today determine our future. Dr. Tucker, a Professor at Vanderbilt University’s Center for Medicine, Health, and Society and Department of French and Italian, is the author of Pregnant Fictions: Childbirth and the Fairy Tale in Early Modern France. Her next book was inspired by a statement made in the modern era. She, like many, listened as George W. Bush gave his January 31, 2006, State of the Union address. After hearing his words, “. . . legislation to prohibit the most egregious abuses of medical research [including] creating human-animal hybrids. . . .” she felt compelled to compile years of research and write Blood Work. Mr. Washington was suffering from both an acute epiglottitis infection (a life-threatening condition) and certain anemia from bloodletting. A prominent physician offered to intubate and transfuse the president, but was refused by the family. Intubating and transfusing were approaches in their early stages of use and considered risky, but only offered at all because of advances that had occurred in the past—advances in thinking that Dr. Tucker deftly describes in later parts of this book. What if that past hadn’t occurred in exactly that way? What if Washington’s family had agreed to try these treatments? Today, Mr. Washington would have been intubated and given antibiotics. Bloodletting would not have been on the treatment menu. His life would have been saved. Transfusion is now viewed as a common life-saving procedure, but the route it took to get to where it is now was not smooth: it was chaotic, ridden with gruesome experiments on animals, competitive, rushed, fraught with letter-writing campaigns that would make current-day Twitterati jealous, halted altogether, and then resumed. What if we in modern science don’t expand our limits and try new things, like scientists in the past have done? Examining recently discovered documents, Dr. Tucker divulges what really happened to that infamous, poor madman, Antoine Mauroy. The notes, bibliography, and index are extensive, and the artwork helps the reader visualize the drama. Did a wayward scientist murder his patient or was there foul play from an outside source? The first part of the drama includes the rise and fall of Jean Baptist Denis. As London recovers from the fire, this French scientist finds his way upward, competing against King Louis XIV and his Academy of Sciences. We meet this vainglorious man while he first transfuses calming calf’s blood into the notoriously mad and unwilling Antoine Mauroy, and again with Perrine Mauroy, his soon to be widow. “But the line between an overabundance of hope and quixotic delusion is rarely clear.” Herein lies the problem: Is hindsight the only real teacher? 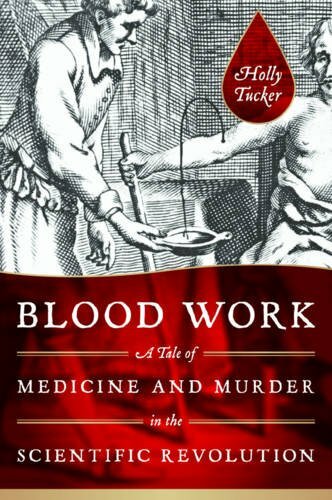 The resulting accusations, the trial, the letter that Dr. Tucker discovers sorting it all out—centuries later—rounds out the 17th century history portion of Blood Work.